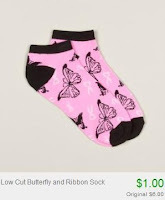 Ladies Socks for the Cure only $1 a Pair + 10% Off or Free Shipping! Right now at Totsy you can get ladies socks for as low as $1.00 a pair! 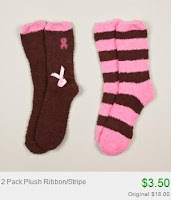 You'll find ankle, quarter, knee high and fuzzy socks in lots of different designs and styles, but all having a theme of breast cancer support. If this is your first Totsy purchase, you'll even score free shipping on your order! If you're not a new shopper, you can use the code couponcabin to save 10% on your entire order.